Taj Hotels are synonymous with all things grand and luxurious. While a night at any one of these hotels is likely to burn a hole in most people’s pockets, you can at least be sure that you’ll have a good, good time. Thankfully, Delhi NCR has numerous Taj Hotels (including three Vivanta By Taj hotels) for everything – be it a hall for your wedding day, or just for some spa-time to pamper yourself. Go ahead and spoil yourself silly now! For us, the ultimate Taj experience in Delhi has always meant a stay at the Taj Diplomatic Enclave in Chanakyapuri. They’ve got the world class Jiva Spa and Salon, stellar restaurants like Masala Art (Indian), Orient Express (European) & Spicy Duck (Chinese fine-dining) and a lovely pool we’d probably spend most of our time at (other than the bar, obviously). All the makings of an impeccable staycation? We think so too. Tariffs: Starting at INR 7,875. Book here. The Taj Mahal Hotel on Mansingh Road has been around forever, but has still managed to keep the standards of service and quality high. One of the things that this hotel is known for (amongst many others) is its 24-hour multi-cuisine restaurant Machan. Make sure that you drop by for their lavish breakfast buffet of croissants, eggs (done a million ways), fresh smoothies and more. For events, any one of The Taj Mahal Hotel’s banquet halls will be enough to impress your guests, but our favourites have to be the Longchamp hall and the Villa Medci. Tariffs: Starting at INR 11,500. Book here. Vivanta By Taj is different from the Taj Hotels, but is still very much a Taj property. 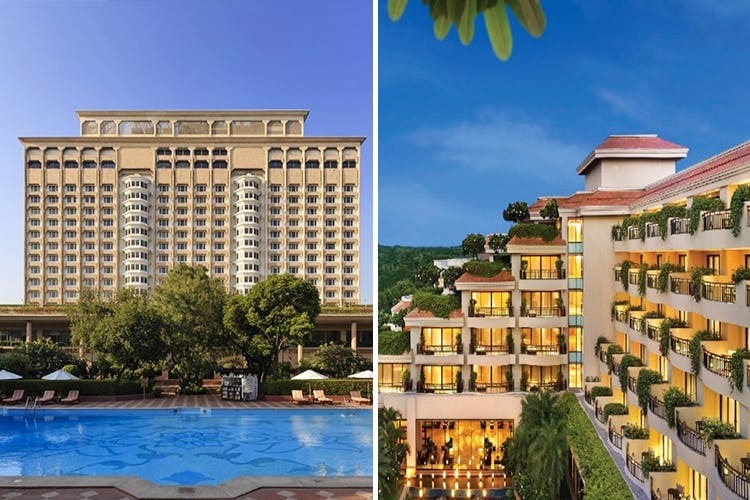 While the Vivanta By Taj – Ambassador near Khan Market isn’t as opulent as the other two Taj Hotels in Delhi, it still looks stunning, has grand hallways, boardrooms – and is pet-friendly too! We also love that it’s centrally located, and that everything from CP, Qutub Minar, Khan and Lodhi Garden are close by. In case you have friends and family visiting who wish to explore Delhi, Vivanta – Ambassador might be a good bet. Tariffs: Starting at INR 6,500. Book here. Spread across seven acres, Vivanta By Taj – Dwarka is a relatively economical option (for hotels in this same category) for those on a business trip. It’s close to the airports, has an impressive business centre called Oval and, once work is sorted, you can chill in their Leisure Centres that have everything from a spa, a beauty salon and fitness centre to a bookshop and four restaurants. Tariffs: Starting at INR 7,000. Book here. A trip to Vivanta By Taj – Surajkund can easily be considered a convenient getaway. It’s away from the main city, but not so far away that you end up coming back super-tired from the drive. Coming to the hotel itself, it’s been constructed in the form of ascending steps, and overlooks the popular Surajkund Lake Complex. Be sure to spend a copious amount of time in their giant pool, book yourself a spa session and drop by their coffee shop for a latte too.